(MPI) – This is the theme of the Midterm Vietnam Business Forum 2018, organized by Ministry of Planning and Investment in collaboration with World Bank (WB), International Finance Corporation (IFC) and Vietnam Business Forum Consortium on July 4th, 2018 in Hanoi. 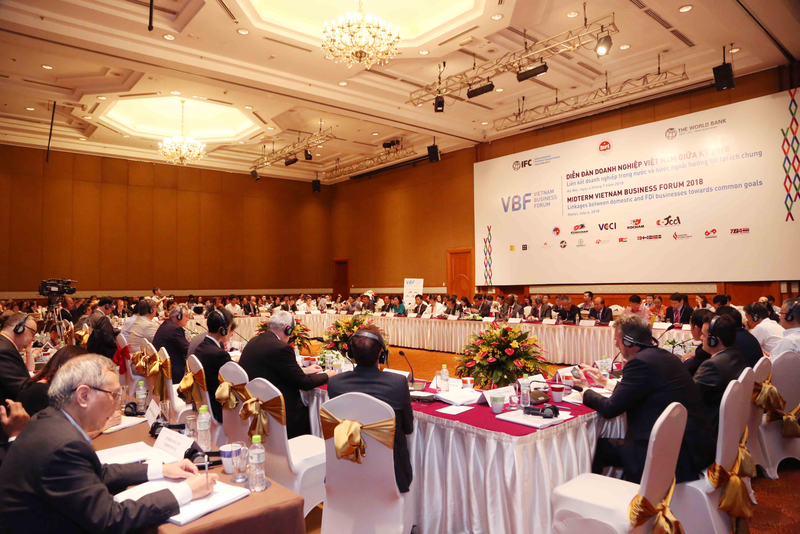 This year’s Forum focused on assessment of the status quo and proposal of resolutions for enhancing connections between domestic and FDI businesses in investment, technology transfer, industrial development, as well as facilitating conditions for the sustainable development of credit resources and financial services in Vietnam. 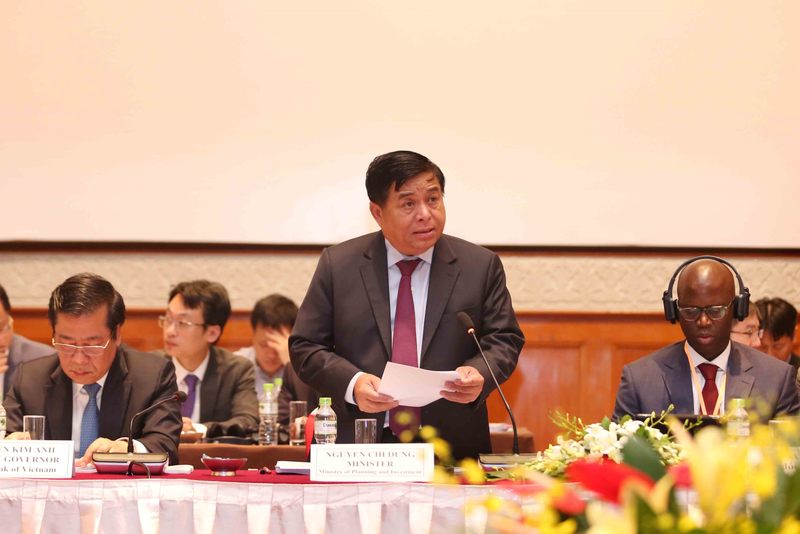 Opening the Forum, Minister of Planning and Investment Nguyen Chi Dung said, the year 2018 marks the 30 years of FDI attraction and management in Vietnam. Looking back on the achievements and efforts of the whole political systems, agencies within the government, from the central to localities and the entire business community in continuously improving the business’s investment environment with 21 years of VBF’s companion, it can be seen that various legal documents were promulgated, policies were updated in time and suitably, many difficulties in implementation were resolved and handled in time. These help to create an open business investment environment, contribute to attracting more and more resources for development investment. Vietnam businesses community, including domestic and FDI businesses, have been growing along with the country, increasing in the number of enterprises and strengthening in potentials. It is also a crucial motivation, contributing to Vietnam’s continuous high growing. GDP in 2017 reached 220 billion USD, 8 times higher than that in 1997, the GDP was aimed to reach 300 billion USD in 2020. Until now, there are 128 countries and territories having investments in Vietnam, with 26.000 FDI projects with the total registered capital above 326 billion USD and the total realized capital above 180 billion USD. FDI sector is more and more affirming its important role in Vietnam’s economy, contributes approximately 25% in the total social investment capital and approximately 20% in GDP, in which 58% of FDI capital focus on the fields of processing, manufacturing, and creates 50% industry’s production value, contributes 72.6% of the total export turnover, creates jobs for 3.6 million direct labor force and 5 to 6 million indirect labor force. FDI sector had spillover effects on the fields of the economy, through access to advanced technology and the international’s standards in businesses management, skill development of labor, as well as creating many jobs in the fields of the economy, etc. However, the linkages between domestic and FDI businesses participating in value chains have not yet met the expectation, the supporting industry’s development and technology transfer are still at a low level. Mr. Tomaso Andreatta, VBF Co-chairman stated that Vietnam’s economy is fast growing thanks to the promotion of export and maintenance of sustained investment from other countries. The Government deserves credit in that it has continued to stabilize the economy and contain public debt. In particular, as a bank representative, he applauded the notable improvement of Vietnam in Fitch’s credit rating. However, many factors may affect this trend, such as: internally, the possibility of a burst of the real estate bubble and the consequences that it may have on the banking system, which would affect the economy, and externally, the increasing protectionism of many countries and economic areas that is also very important to Vietnam’s trade. Therefore the right choices are not to protect the local market but to continue on the path of being one of the countries that have the most free-trade agreements in the world, ratify the signed ones and reform legal system in order to comply with them. Speaking at the Forum, Mr. Vu Tien Loc, VCCI’s President, represented the domestic and foreign business community in recommending solutions to the Government in reforming economic institutions, improving business environment, which is a way that we can always be proactive in implementation, always feasible and inexpensive while the efficiency is very significant, especially in boosting import and export as well as taking advantage of new opportunities in trade and investment. Specifically, the business community proposed that the Government continue to drastically direct the implementation of administrative reform, especially on import-export procedures, national one-door mechanism and specialized inspection of export-import goods, strengthen actions to enforce trade facilitation obligations in the WTO Agreement on Trade Facilitation and take full advantage of the opportunity from the review for preparation of ratification and implementation of the CPTPP to create a breakthrough in the comprehensive reform of the legal system, economic institutions in accordance with new standards. At the same time, making the most of export advantages from FTA is one of the solutions for Vietnam’s export to find its own way, to be stable in the context of complicated world trade. 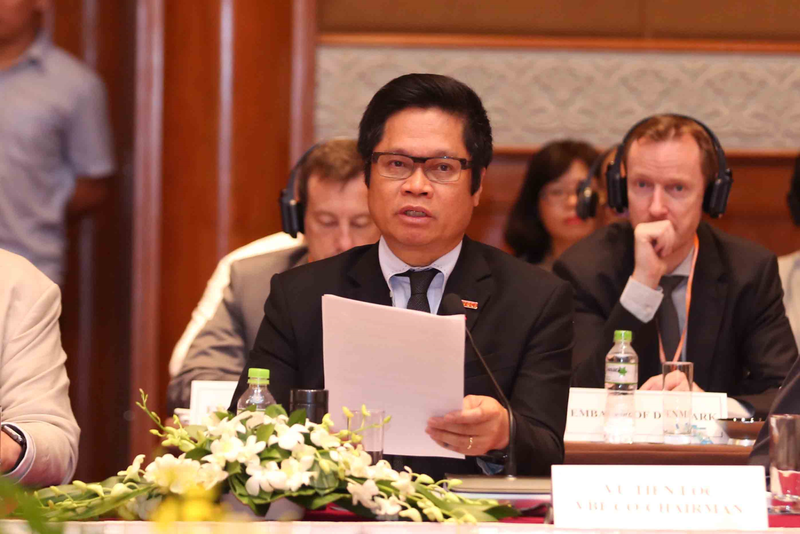 In particular, the Government should conduct procedures for ratifying the CPTPP so as the Agreement will soon take effect in Vietnam, and immediately implement preparation for executing commitments in the Agreement, from both the Government and enterprises, especially commitments in institutions and commodities (tariffs, rules of origin) for businesses to effectively utilize the opportunities offered by the CPTP right after it takes effective. The Government is also recommended to continue to promote the signing of the Vietnam-EU Free Trade Agreement as soon as possible, at the same time, try to work with partners to complete the legal revision of the Investment Protection Agreement, to reach a signing and ratification. In this aspect, the business community also calls for the active participation of the EU Delegation and EU FDI enterprises in Vietnam as well as all businesses that may benefit from these agreements to raise their voice, coordinate in campaigning for the process of signing and ratification of the Agreements to be accelerated as soon as possible. Promotion of the effective implementation of other FTAs is also needed. FTAs are opening good opportunities for Vietnam to boost exports. But the increasing trend of trade deficit with markets that are having FTAs with Vietnam shows that Vietnam has not made good use of the opportunities opened up by these agreements. This requires more efforts to guide, support and empower the business community. The priority action is to review and eliminate inadequacies in practice that are blocking enterprises from taking advantage of the FTAs, especially, it is necessary to faster reform the administrative procedures related to export-import. 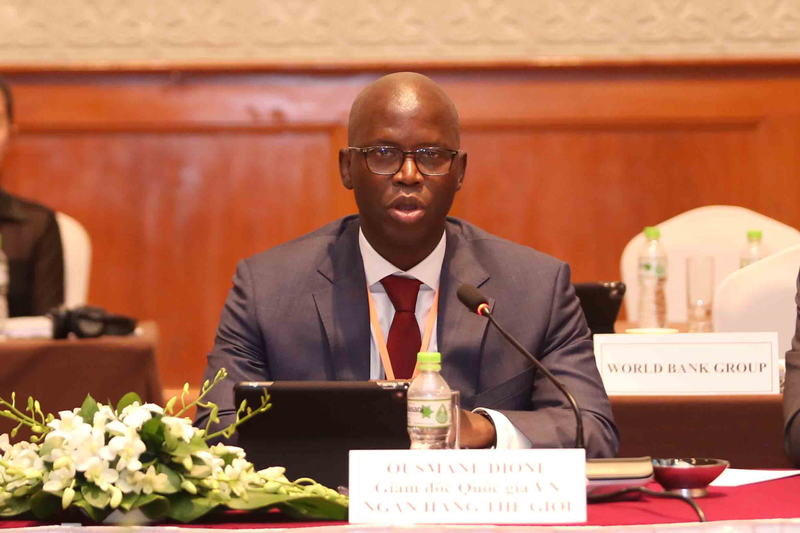 As a consultant, Mr. Ousmane Dione, Country Director of the World Bank in Vietnam, said that in order to strengthen linkages between domestic and FDI production enterprises, the domestic production enterprises need to enhance its capacity and competitiveness, to become component suppliers for foreign investors, i.e. to participate in the global value chain. This is also an active step to take advantage of the opportunity brought about by the Industrial Revolution 4.0. The Midterm VBF 2018 took place with three sessions, walking up the value chain, facing technological challenges and developing financial resources for sustainable growth. Through the exalted discussion sessions, business associations and working groups of the Forum gave relevant and devoted comments and recommendations to government’s agencies, focusing on some issues of strengthening linkages between FDI and domestic enterprises, which requires FDI enterprises to actively create opportunities for Vietnamese enterprises to step by step participate in the value chain, the domestic enterprises to improve the management capacity, production level, technical technology and product’s quality, etc. The Government must take measures to support the flowing and efficient integration process. Regarding the law enforcement, many agencies have different ways of understanding and applying laws due to unclear regulations and limited staff capacity, especially, issues related to the Securities Law, health, technology transfer, environment, energy and Laws on Tax and Customs, etc. Regarding labor issues, increasing of labor productivity, minimum wage, granting labor permits and clarifying the "voluntary" participation in social insurance for foreign labors are especially emphasized. In terms of infrastructure development, it is necessary to continue improving the policy mechanism to attract investments through PPP form in a more effective way, diversify renewable energy sources such as wind, sun, geothermal. Besides, there are other issues that the business community interest in, such as trade facilitating, increasing protection of intellectual property rights, improving quality of education, visa-free entry, standardizing Vietnam’s accounting system, administrative reforming, governance, and integrity, etc. During the discussion, representatives of some ministries and branches also had detailed, specific feedbacks and exchanges, thereby clarifying the contents of the mutual interest, setting the requirements that needed to further improve the tight cooperation between the Government and the domestic and foreign business community, in order to solve obstacles in the coming time. Closing the Forum, Minister Nguyen Chi Dung highly appreciated the contributions of the working groups and the business community as well as feedback from the ministries, branches. The Ministry of Planning and Investment will work with ministries and branches to acknowledge and receive legitimate comments from the business community and work closely together to effectively handle the proposals./.